I recently attended a cooking class by Don Genova held at Cook Culture. The topic was “Sustainable Seafood”. We learned how to make five fabulous dishes: Salmon Tartare with Kimchi and Asian Pear Salsa, Tuna Tataki, Mussels Saganaki, Voodoo Shrimp with BC Spot Prawns, and Halibut Cheeks in an Eggplant, Bell Pepper and Shitake Mushroom Sauce. If you get a chance to take a cooking class from him, I highly recommend it. I felt like I had died and gone to heaven. Not only did I get to watch a master chef prepare these incredibly light and flavourful dishes, I got to eat them too. However, the highlight of the evening for me was feeling an overwhelming sense of gratitude that I live here on the West Coast and have ready access to the finest and freshest seafood. 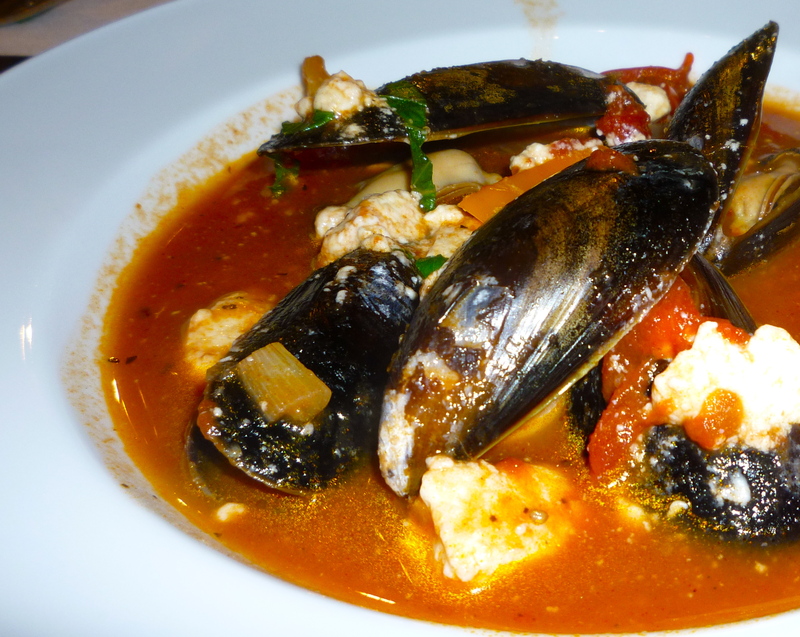 The first of the five dishes I decided to try creating at home was the Mussels Saganaki. I have only recently learned to love and appreciate these humble little guys who cling to pilings. I headed down to Cowichan Bay Seafood where I was able to buy fresh Saltspring Island mussels. Since they were already debearded, I only had to scrub them a little. Here is Don’s recipe. I followed it exactly. Since I was serving this as an appetizer, I allowed 6 mussels per person. Debeard the mussels. 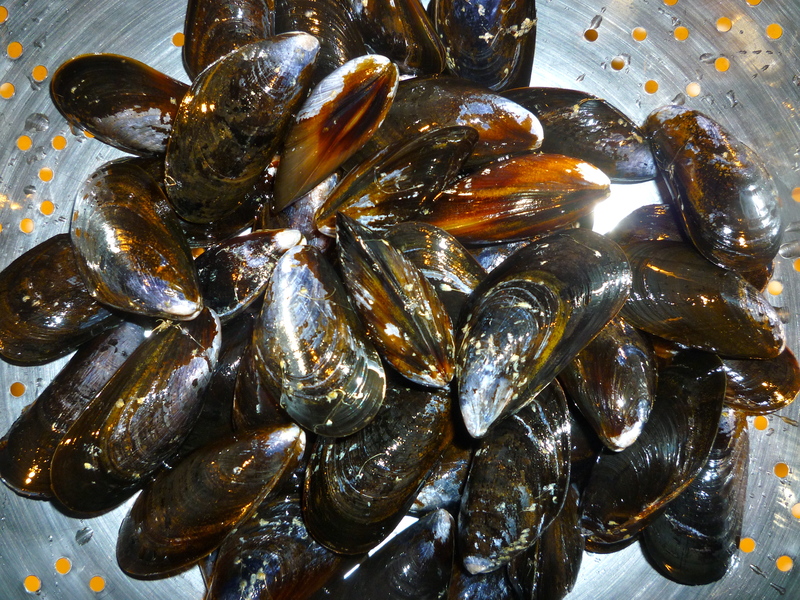 For the best demonstration of how to debeard and clean a mussel, view this video. This video also includes important tips about food safety when handling shellfish. In a large, heavy-bottomed pot, heat the olive oil on medium-high heat, then add the onion, garlic and bell pepper. Saute until the onion is translucent, then add the oregano and thyme. Stir around for a bit, then add the can of tomatoes and their juices, and the red wine. Bring to a boil, then simmer for a few minutes to let the flavours develop. Return to a boil, then toss in the mussels and cover the pot. Cook for about 3-5 minutes, or until the mussels have opened. Just before serving, stir in the feta cheese and basil leaves. Season to taste with salt and pepper. Ladle into bowls and serve with lots of crusty bread. I served it with a Granary Baguette and a loaf of Ciabatta from True Grain Bakery in Cowichan Bay. I will definitely make this again. This entry was posted in appetizers, seafood and tagged mussels, mussels in tomato-based broth, mussels with feta, saltspring island mussels. Bookmark the permalink.